When VMware (s vmw) CTO sat down with our own Stacey Higginbotham at Mobilize this morning, he laid out a mobile plan that reeks of success on par with what VMware has achieved in server virtualization over the past decade. And the trick to accomplishing that might be VMware’s quest to make its mobile hypervisor technology a part of the core Android operating system kernel from Google (s goog). Anyone following VMware is likely familiar with the mobile virtualization plans it laid out at its VMworld event last month. Essentially, the company wants to enable the consumerization trend by virtualizing mobile devices like its technology already does for servers and desktops, and then delivering applications designed to run natively on these new form factors such as tablets and smartphones. This effort falls under the product banner of Horizon Mobile, which Herrod describes at a high level as providing a dual persona for devices — one for personal use and one for corporate use. A key component of VMware’s strategy is its partnership arrangement with both Samsung and LG to incorporate the hypervisor into the versions of the Android operating system that they’ve developed to run on their handsets. When the partnerships finally bear fruit, all of the manfacturers’ Android devices will come with this feature, meaning that an employee just needs to show to work with his device and let IT get the enterprise-centric virtual machine up and running. But, Herrod said today, VMware is also working with Google to get its virtualization hooks incorporated into the core Android that Google puts out and that manufacturers like Samsung, LG and others modify for their specific devices. That could be a huge deal for VMware, as Android devices account for almost 50 percent of all devices, according to recent estimates. Getting its technology incorporated into the Android OS coming straight from Google would make VMware the de facto mobile virtualization option, and would save it the hassle of having to neccesarily strike deals with every single device maker. 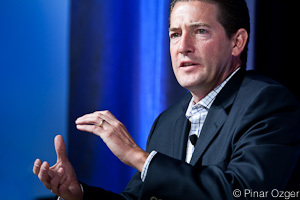 It’s difficult to gauge how many mobile devices VMware might find itself on compared with the number of servers it virtualizes in data centers, but Herrod himself provided some insight into the potential: he said he access five devices per day and had three on his person at the event. The elephant in the room, though, is Apple’s (s aapl) iOS, which probably represents the most disruptive force in the consumerization of IT thanks to its presence on iPads and iPhones. VMware certainly could virtualize iOS devices, Herrod said, but one can imagine that Apple isn’t too keen on the idea of having Android apps running on its devices. Technologically, there aren’t many hurdles, but business issues still can jam the works. VMware isn’t about to lose out on the power of iOS altogether, though. Today, for example, it rolled out versions of its SlideRocket and Socialcast applications designed for iPads. The result of all the technological wrangling, Herrod explained, is a litany of options around how users might go about managing their split-personality devices. You’ll have to watch a replay of Herrod’s discussion to get the whole story, but Herrod made it sound like the possibilities are almost endless in terms of intelligently separating business use from personal use. Interestingly, Cisco’s Tom Gillis noted in an earlier Mobilize session that putting a hypervisor on the phone isn’t an ideal solution to consumerization security because it will result in too high a performance hit. VMware has claimed its technology minimally affects performance, and even that is mitigated to some degree by running apps specially designed to run in that environment. If the company wants to buy phones for everybody – why not? But why would an individual want to kludge up his phone with hypervisor just because some IT guys want some new technology to play with? I’m not opposed to the idea of a hypervisor on Android devices. It could be useful for running multiple Android VMs such as Home and Work. I think you’d find that they will need a good multi-core CPU and tons of RAM, though. It should be noted that Linux already has two hypervisors available in the kernel. I think it would be pandering to special interests to do anything but improve the existing hypervisors in the kernel. Bolting on third party proprietary software from a clearly Linux-hostile vendor seems unwise at best. KVM and Xen are very good hypervisors. Xen in Linux 3.0 is really very good and it has been ported to ARMv7 compatible chipsets like Nvidia Tegra. Can’t they just open-source the technology? I don’t want to see so many proprietary technologies built inside Android.